On 18 September 2007, the band performed the complete album live for the first time at Town Hall in New York City. The gig was filmed in high definition and is now presented here as the first ever Counting Crows live concert Blu-ray release. The band have maintained a hugely successful career with global album sales now in excess of 20 million but they have always saved their finest moments for the live arena. 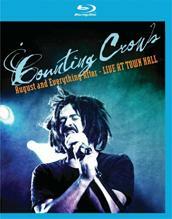 Now for the first time a Counting Crows live concert film is available to own. Bonus Features - Interview In Depth With Adam Gurvitz & Charlie Gillingham. On September 14, 1993, alternative rock band, Counting Crows, released their first commercial album, and the world of music was forever changed. Or... maybe not, but it was still a pretty solid effort that did prove to be quite successful. Blending some catchy melodies, personal, often somber lyrics, and a penchant for musical storytelling, the group skyrocketed to fame and has continued to enjoy a strong following ever since. 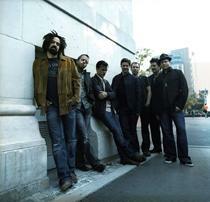 Filmed in New York at The Town Hall in 2007, 'Counting Crows: August and Everything After' is a concert video showcasing one of the band's live performances of their much celebrated debut album. Featuring some new arrangements and the same, intimate, improvisational performance style that they have come to be known for, the show provides a nice tribute to the record that launched their careers. This iteration of the band includes Jim Bogios on drums, David Bryson on guitar, Adam Duritz (and his hair) handling vocals, Charlie Gillingham on piano, David Immergluck on guitar, Millard Powers on bass, and Dan Vickrey on guitar. The show sticks firmly to the songs from 'August and Everything After' and even adheres to the album's original track order (with one exception). The set list features some of the group's bigger and popular hits, including 'Round Here,' 'Mr. Jones,' 'Rain King,' and 'A Murder of One.' While the tracks have been reworked to some extent, reflecting the shifting and evolving styles the group has developed over the years on tour, all of the songs still very much retain the core of what made them so appealing to begin with. The show kicks off by going straight into the music and the band only takes brief respites here and there for Duritz to share some personal stories about select tracks and the group's history. Though he can come across as a little awkward, losing his train of thought mid-story at times, the lead singer connects well with the audience and has some decent charisma and stage presence. Marked by an often dramatic and very passionate performing style, Duritz sort of sways, bobs, and hops around the stage in a hypnotic trance of bittersweet bravado. Theatrical hand gestures that reach out toward his audience with a tortured air of suffering, and often pensive, tightly closed eyes, round out the singer's emotional routine of onstage antics. The music itself is as strong as ever (or not, if you aren't a fan) and the band bolsters Duritz's vocals perfectly. Most of the tracks tend to be rather downbeat, with some truly depressing lyrics focusing on isolation and loss, but in between all of the musical melancholy are some more upbeat rhythms and riffs as well (particularly on 'Mr. Jones'). Famous for their improvisational style, with Duritz actually known to make up complete songs right on the spot, the band has a somewhat raw, unpredictable quality that makes each performance feel unique. Duritz's bare, sprawling vocals fit well with his solemn words, and the singer will frequently employ a more conversational style in his presentation, almost like he's talking more than singing. This all builds to various passionate bursts of melody and chorus, and works nicely with the heavy storytelling aspects of the songs. While mostly fitting, there are indeed times when Duritz seems to go over-the-top, and he can sometimes come across like a homeless madman rambling on a street corner. Well, an unusually talented and articulate homeless madman rambling on a street corner, but you get the idea. The filmmakers do a decent job of shooting the actual concert, and the visuals and editing style tend to complement the music nicely. The stage is illuminated by stark, dramatic lighting that shifts between cool and warm colors depending on the mood of the track being played. From deep blues and purples, to bold reds and oranges, the various moods and visual tones enhance the musical performances without overpowering the more stripped down, intimate nature of the show. Angles vary throughout, with the usual vantage points and compositions found in most concert films all on display, including various shots of the band members, close-ups of instruments, and audience POVs. Like the lighting design, the camera work and editing also reflect the tempo of the current song. Things start off slow with little movement and few cuts, but as the tracks grow more intense the filmmaking style becomes more overt and aggressive. Shaky camera movements, focus shifts, and quick cuts all make appearances, timed well with the swells and dramatic beats of the songs. Though the style can sometimes get a little too forceful, coming close to overshadowing the band's performance, for the most part, the filmmakers do a good job of adding some welcomed excitement to the proceedings. 'Counting Crows: August and Everything After' is a solid effort from the popular band. Though the group has gone on to produce good material since, their first album still remains some of their best work. With a unique and improvisational performance style, Duritz gives the concert some strong stage presence, and together he and the other musicians inject some new life into some of their old staples. While those who aren't admirers of the band will find little to like here, fans should be more than pleased with the show, and those new to or curious about the group might want to check this out as a nice introduction to their particular musical stylings. Eagle Rock brings 'Counting Crows: August and Everything After' to Blu-ray on a BD-25 disc housed in a standard case. After some logos and warnings, the disc transitions to a standard menu. A six page insert is also included that features a forward by Duritz and some photos from the show. The concert is presented in a 1080i/AVC MPEG-4 transfer in the 1.78:1 aspect ratio. Shot digitally in high definition, the show displays a sometimes pleasing level of detail and color, but does suffer from some unwanted artifacting. The source is fairly clean but there is some noise visible from time to time. More distracting, however, is some frequent aliasing. This is most noticeable in wider shots and while not horrible, it does hurt the presentation. Other artifacts, including banding, are also apparent periodically. Detail itself is good, though some shots do look a bit soft. The lighting design of the concert leads to a strong display of color, and the shifting warm and cool hues pop right off the screen giving a sometimes strong level of depth. Black levels can appear a bit elevated at times but overall contrast remains pretty decent throughout. While the colors and detail levels are often rather nice, some aliasing and other technical issues (most likely inherent to the source itself) do hold back the presentation. Still, like most concert discs, the focus is really on the audio, and the video transfer certainly gets the job done well enough. The show is provided with a DTS-HD Master Audio 5.1 track, an uncompressed PCM 2.0 track, and a Dolby Digital 5.1 track. Though nothing to get too excited about, the DTS-HD MA mix does a good job of presenting the concert with a nice level of immersion and fidelity. Vocals are crisp and clean allowing one to make out almost every syllable of Duritz's melodic rambling. Separation of the musical elements is decent, with the various instruments spread across the front soundstage. Like in most music discs, rears are mostly reserved for crowd reactions and minor echoes of the songs, and though at times subtle, they do provide a welcomed level of immersion, giving the listener an authentic live concert feel. Dynamic range is good, especially in some of the more diverse tracks that gradually build in intensity, but bass is a little subdued. With that said, the low end does still have some noticeable presence on certain songs. All of the musical elements are balanced nicely within the mix, and the vocals, instruments, and crowd reactions don't ever overpower one another. While I primarily listened to the DTS-HD Master Audio 5.1 track, I did sample the Dolby Digital and PCM mixes as well. The Dolby track was competent, though it did lack the fidelity of the DTS, and while also strong, the PCM mix was of course missing the added immersion of the surround tracks which I did find to be a noticeable benefit. It may not be the most impressive sounding concert disc, but fans of the band should find little to complain about. In Depth with Adam Duritz and Charlie Gillingham (HD, 41 min) - Presented in 1080i with LPCM 2.0 sound and optional English, German, Spanish, and French subtitles, this is a comprehensive interview with the two band members. Recorded separately, they both trace the origins of the band detailing how they got signed and how their first album came together. Other topics touched upon include Duritz's improvisational style, various creative difficulties they ran into early on, and the events which led to the concert. A pretty honest and in depth conversation, fans should definitely check this out. 'Counting Crows: August and Everything After' is a solid concert disc from the band, one that features a strong, live rendition of their popular debut album. The video quality isn't exactly impressive, but it gets the job done, and the audio presents the music with good fidelity and technical proficiency. Supplements are slim, but the lone extra does provide some interesting insights. Fans should definitely be pleased, and even those new to the group may want to give this a look.